On a recent long weekend getaway to my parents', I stopped in at the local u-pick farmer's market and noticed that tomatoes were in season. Inspired by our recent family vacation to Italy, I picked up a basket of Roma tomatoes - perfect for creating a basic tomato sauce. This recipe for basic tomato sauce is the most basic tomato sauce there is. You can add seasonings like garlic, onions, or herbs, but using just tomatoes is a great neutral base for whatever you would like to make, from pizza to spaghetti and even lasagna. Romas are recommended for canning/freezing because they have more flesh with less juice and fewer seeds. They are smaller, which means more prep work, but it's worth it. Bring a large pot of water to a boil over high heat. Fill a large mixing bowl with ice and cold water, and set next to the stove. To prepare the tomatoes for blanching, core out the stems and slice a shallow x in the bottom of each. This will help when you peel the skin from the tomatoes. Working in batches, using a slotted spoon drop several tomatoes in the boiling water. Cook until the skin starts to wrinkle, approximately 1 minute. Lift the tomatoes out with the slotted spoon and place directly into the bowl of ice water. Continue with the rest of the tomatoes. Transfer the tomatoes into another bowl as they cool. 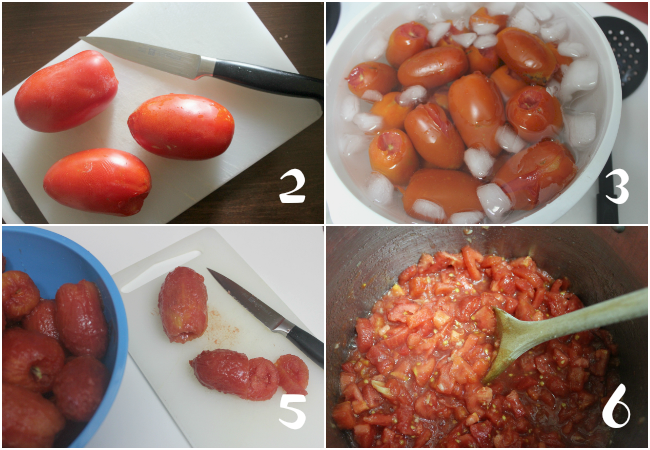 Using clean hands or a paring knife, remove the skins from the tomatoes. If your prefer a chunkier sauce - roughly chop the peeled tomatoes. If you prefer a more smooth sauce - pulse the peeled tomatoes in the food processor. Once chopped or pulsed, transfer to a stockpot. If using, add garlic to the pot. Bring the tomato sauce to a simmer over medium heat. Continue simmering for 30 to 90 minutes, stirring occasionally until the sauce reaches the taste and consistency that you like. Shorter cooking times will yield a thinner sauce with a fresher tomato flavor; longer cooking times will thicken your sauce and give it a cooked flavor. Watch your sauce as it simmers and stop cooking when it reaches a consistency and flavor you like. When finished cooking, stir in the lemon juice and salt if canning. Refrigerating - Let sauce cool, then transfer to sealable container. Refrigerate up to 1 week. Freezing - Let sauce cool, then transfer into freezer bags. To freeze, lay bags horizontal in freezer. Sauce can be kept frozen for 3 months. Canning - Transfer the hot sauce into sterilized mason jars. Top with new, sterilized lids. Screw on the rings until finger tight. Process in a pot of boiling water for 30 minutes. Make sure the entire jar is covered in water. Let cool completely on the counter. When you hear a “pop” (lids inverting and creating vacuum seal), the sauce has successfully been canned. If there are any jars that do not seal properly, refrigerate and use within a week or freeze and use within 3 months. Canned sauce should be stored in a cool, dark pantry and used within 1 year. 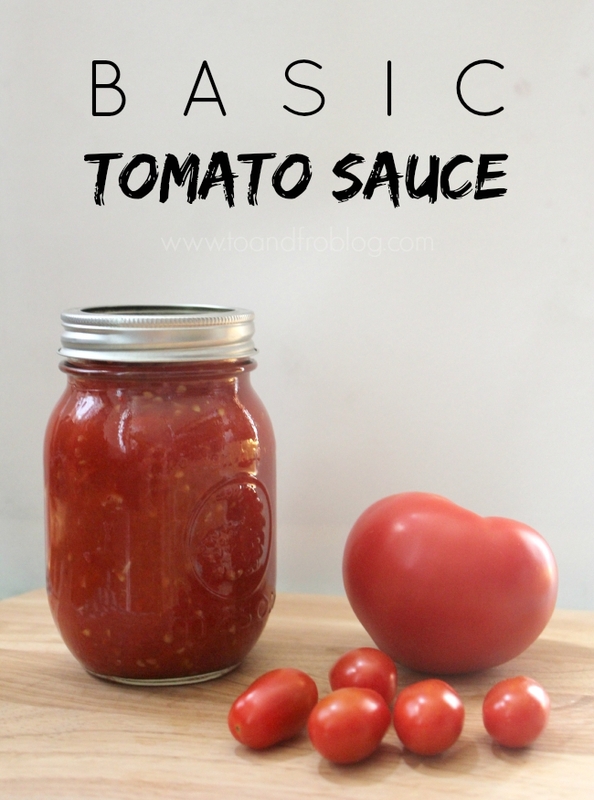 Have you ever made homemade tomato sauce?